In the spring of 2012, I was still relatively new to the Extension Service and very new to the world of 4-H as I had originally been hired in Extension’s Community Resources & Economic Development unit. So, when I was asked to teach the Heritage Class at Older 4-H Members’ Conference (OMC – one of our three major state camps for 14-21 year olds), I was both excited and terrified. I had not grown up in 4-H, and a year before this I could not have told anyone what the four Hs even stood for; now I was being asked to teach a two-hour class for four days at a major camp. “These kids will eat me alive!” was my first thought, but then I began looking for resources to plan my lessons. I had learned that Heritage Class had become a little stale in the past couple of years, where students made small heritage crafts and the like, and it was not very exciting. I also learned that the mission of OMC is to develop leadership, so I decided to take a new approach with the class. I wanted to focus on a different topic each day, and for there to be meaningful discussion with those in the class. As I was putting my ideas together, I spoke with our state 4-H leader, Debbie McDonald, who was very supportive of my thoughts for a revamped Heritage Class. She gave me a card for the National 4-H History Preservation Team, and suggested that I look at their website for guidance. When I looked online, I could hardly believe all of the amazing resources that came pouring out! I was able to develop the four topical days regarding the history of 4-H and music in the 4-H program just from what I found on the website. My favorite use of the site came from the section on 4-H films. I decided to make the final day of my Heritage Class into “movie day,” because the campers were tired and needed some time to relax. But I also determined that our movie must fit our goals, and that we would have a discussion. The 4-H History Preservation website lead me to the film “The Green Promise” staring Walter Brennan and Natalie Wood. When I previewed it, I found the film to be a bit dated, but I thought that it still had a great message, could certainly be used for programming, and might be something that the Heritage Class participants would enjoy. 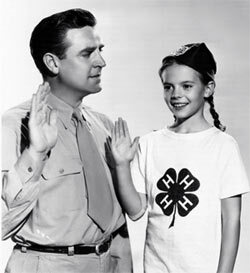 Robert Paige inducts child star Natalie Wood as a member of 4-H in “The Green Promise,” a Glenn McCarthy production for R-K-O release in which Marguerite Chapman and Walter Brennan co-star. I could never have dreamed how much the kids in my class loved and appreciated this film! They hung on every word, and when it was through they had a great discussion about the film’s message, the time period in which it was made, what about it was relevant or not relevant to today, and a host of other topics. I could not have been more excited. It was at the end of that week that I knew 4-H was the right place for me. A few months after that class, the Extension Service moved my appointment to the 4-H Youth Development Unit as the Cultural Resource Specialist, and I became the first full-time Extension Historian and the Historic Preservation Officer of Jackson’s Mill State 4-H Camp. Now I use the National 4-H History Preservation website on a regular basis, and it is one of the first resources to which I point anyone when they are looking for any aspect of 4-H history. I have used the site to develop curriculum, write flag ceremonies, and to allow others to appreciate all of the culture and heritage that is enveloped in the 100+ years of the 4-H program. As a new member of the 4-H family, I now proudly say the 4-H Pledge, sing “The H’s Four,” and use the myriad resources available to promote the heritage of the best youth development program the world has ever seen. This entry was posted in History and tagged 4-H History, 4-HHistoryPreservation.com by Chad Proudfoot. Bookmark the permalink.